Forty years after his flight across the Atlantic, at age 65, Charles Lindbergh wrote 'The Wisdom of Wilderness' for Life magazine (22 Dec 1967). It was the lead article for a special double issue in 1967, with the theme 'The Wild World', which was printed on the cover. 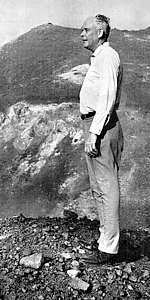 Lindbergh was still an aviation consultant, but had been devoting much of his time to conservation. As a director of the World Wildlife Fund, he worked to set aside wild land areas all over the world and to protect endangered species, particularly the blue whale. “be a reservoir for power. Obviously the scientific progress so alluring to me is destroying qualities of greater worth. … with wilderness outside. Had the choice confronted me, I would not have traded nature's miracles of life for all of science’s toys. Was not my earth's surface more important than increasing the speed of transport and visiting the moon and Mars? If I were entering adulthood now instead of in the environment of 50 years ago, I would choose a career that kept me in contact with nature more than science. … From the dynamics of an atom, nature produces the tranquillity of a flower, the joy of a porpoise, the intellect of man—the miracle of life. In wildness I sense the miracle of life, and beside it our scientific accomplishments fade to trivia. 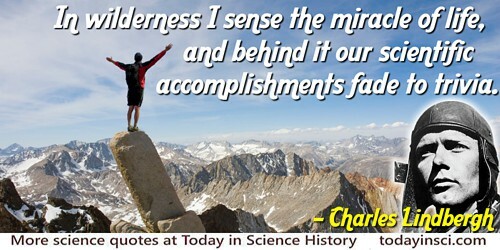 Science Quotes by Charles A. Lindbergh.